There are many species of fish available in the Calcasieu Estuary. The most sought after inshore gamefish are the speckled trout, redfish and flounder. Other available species include black drum, sand trout, sheepshead, croakers, and ladyfish. In addition, there are many more gamefish species available along the Southwest Louisiana coastline or at the near shore oil platforms, including bull redfish, cobia, tripletail, spanish and king mackeral, pompano, bluefish, snapper, jack crevalle and sharks to name a few. Our Captains are all USCG and Louisiana licensed professionals with years of experience fishing Calcasieu Lake. They are very friendly, knowledgeable, patient and helpful. Highly experienced anglers and first timers alike will enjoy fishing with our seasoned pros. Our fleet consists of four 24 ft. Triton Boats or similar center console open sport fishing boats powered with Mercury Outboards. We are fully insured for your protection and can host groups of all sizes. Calcasieu Charter Service offers superior waterfowl hunting in the legendary fields and marshes of Southwest Louisiana, the heart of the Mississippi Flyway. We provide a quality hunt by offering complete comfort and superb hunting over realistic decoy spreads on the finest lands Southwest Louisiana has to offer. Our lands are the winter homes to thousands of waterfowl. Every season gigantic flocks of Snows, Blues, Specklebelly and Canada geese surround our hunting areas. In addition numerous species of ducks, including mallards, pintails and teal flock here to feed and rest. Our guides have one goal, to make your trip a memorable experience each time you hunt with us. Adjacent to the Lacassine National Wildlife Refuge, our lands consist of thousands of acres of rice, soybean and plowed fields on which some of the finest mixed bag gunning in the country may be had. Comfortable pit blinds, ATV's and experienced guides ensure a relaxed hunting experience which you are sure to enjoy. The Louisiana waterfowl season runs from November to February. In the past several years we have enjoyed a liberal sixty day season with a liberal bag limit on both ducks and geese. There is an early teal season in September each year which is typically nine to sixteen days, followed by the standard waterfowl season beginning in early November. Our duck season is divided into two splits, the first of which takes place in November. The second split commonly opens in mid December and closes in mid to late January. The goose season runs from early November through early February. The Calcasieu Charter Service Lodge is a full service facilty located 15 miles south of Lake Charles, LA. It is in the heart of a small settlement on the eastern shoreline of Calcasieu Lake known as Hebert's Summer Place. It is often referred to as Hebert's or Hebert's Marina after the marina which has been a gathering place for fishermen for decades and remains the epicenter of trout and redfishing on Calcasieu Lake. It is the only marina which launches directly into Calcasieu Lake, which is known for producing giant speckled trout. The Lodge can comfortably accommodate a maximum of 20 guests. Five Private rooms sleep up to four guests each, with very comfortable, custom bunk style beds. Tastefully decorated and kept immaculately clean by our service staff, the lodge has hosted people from all walks of life. From the heads of major corporations to elected officials to the family next door, they have all been here. A quiet, peaceful atmosphere surrounds the lodge and settlement. It is a great place to come and unwind, relax and have some fun. An ideal place for corporate gatherings and entertainment as well as family pleasure. We offer a large dining area which serves up to 24 people. It also serves as our meeting room with satellite TV, VCR, and slideshow capability. Fax and wireless high speed internet service is also available. We specialize in catering to groups both small and large. We have held successful corporate events, crawfish boils, bachelor parties, and family reunions to 65 persons. Allow us to host your next event, contact us for more details on what we have to offer. Monday, March 21, 2005 at 6p.m. Great weekend of fishing on Calcasieu Lake. Good weather, light traffic and hungry speckled trout were biting fast and furious for our customers the last couple of days. 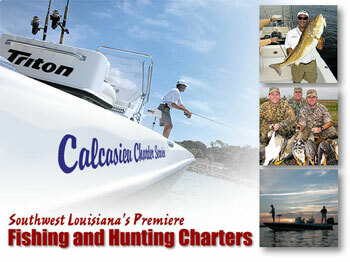 Calcasieu Charter Service guides Capt. Jake Longenbaugh and Capt. Steve Strodderd put their groups on good numbers of specks. Despite the mess from Rita, the fish are biting and the weather has been cooperating. We have our boat stalls at Hebert's Marina back in operation, equipment in order, and guides ready to take your group fishing. The lodge is shaping up as well, but still about two weeks away from being full service again...just in time for duck season. We have been making other arrangements for those needing overnight accommodations while the lodge undergoes repairs. Excited to return to some normalcy, we will make the switch to camo in a few days...and it looks to be very promising. We are holding a significant number of ducks at this point in our rice fields and the numbers should grow as we continue to get things flooded up for the season in the coming week. Of course, along with the ducks, the specklebelly and snow geese will be loading up even more this week on the next front. Congratulations to Staff SGT "P" John K Mayne on his recent fly fishing catch. While fishing yesterday April 30, 2008 on Calcasieu Lake with Capt John Saucier of Calcasieu Charter Service, SSGT"P" Mayne caught a 6.91# speckled trout. The catch, which should garner 7th place in the LOWA LA Fly Fishing records is being submitted for approval.